Injured in a Car Wreck? Do Not Be a Victim Twice! 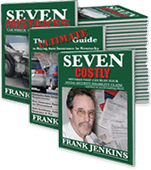 Before you talk to the insurance company, get my FREE book: 7 Mistakes Car Wreck Victims Make in Kentucky, and How to Avoid Making Them. If you've been in a Kentucky car crash, this book offers a step-by-step look at what you can expect as your case heads to settlement or the courtroom. Auto insurance is mandatory in Kentucky -- you cannot legally own or operate a vehicle in the state without it. This FREE book provides cut and dry answers to most auto insurance questions, including auto insurance requirements, types of coverage, and how rates are determined. Do You Have Questions About SSD Benefits? Our FREE book, Seven Costly Mistakes That Can Ruin Your Social Security Disability Claim – And How to Avoid Making Them, will help answer your questions about SSD benefits – including eligibility, the legal process for obtaining benefits, and how long your claim will take. The Frank Jenkins Law Office has helped many Kentuckians deal with insurance companies. Based on our experience, we’ve put together a list of tips for anyone dealing with insurers so that your claim has the best possible chance for success. For more than 20 years, the Frank Jenkins Law Office has been helping disabled individuals obtain the Social Security Disability benefits to which they are entitled. Our attorneys, based in Lexington, Kentucky, guide disabled workers through the complex rules and government red tape. The law office of Frank Jenkins will review all of the information about your case to look at our options in pursuing a victory for you. Our proven experience allows us to use a wide variety of strategy and tactics when pursuing justice on your behalf. Our initial consultation is free, and during this time we will gather information from you to gain a better understanding of the specific details of your potential case. Once we have established the current circumstances of the reason for your consultation, we can determine if you have a case. We are happy to do the initial consultation in our Lexington office, at our clients’ homes, or at a medical facility you may be staying in if you were involved in an accident. Our firm doesn’t represent our clients based upon their financial income. We believe that your money should not determine your access to your legal rights, which is why we represent most of our clients on a contingency basis, with few exceptions*. If we take your case, you don’t pay us unless there is a settlement or verdict that we achieve on your behalf. Please contact us for any questions you may have about your case. Remember that the initial consultation is free, so call us today at 859-389-9344 or email us using our online contact form. We look forward to working with you through this difficult time. The Frank Jenkins Law Office, based in Lexington, has been representing injured people across Kentucky for more than 20 years. Our attorneys are dedicated to helping victims obtain the justice they deserve – and the compensation they need. The attorneys at Frank Jenkins Law in Lexington understand that legal action is not your first priority when you have been hurt – medical care and financial security are the most immediate concerns. It’s our job to fight for your rights so that you can concentrate on your health and family, while we deal with the insurers and those responsible for your injuries. We can help you and your family. Call us today at 888-992-3927 or contact us.